After World War II, the single room seemed the set to end all sets within European drama circuit. Most famously in Sartre’s “No Exit” and Beckett’s “Endgame,” this basic structure, inhabited by just a few characters, manages to become a microcosm for the whole of human social life. What more could you need, then? 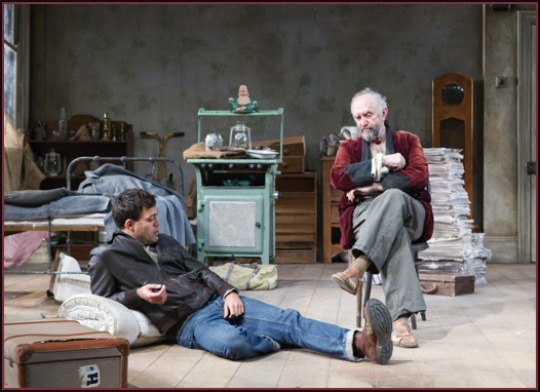 “The Caretaker” is Harold Pinter’s one room play. Leaky and crowded with shabby old furniture, a small London flat becomes the world to Mick (Alex Hassell), his brother Aston (Alan Cox) and an old man named Davies (Jonathan Pryce), all of whom, for one shady reason or another, are no longer up to the strain of existing in the outside world. Of course, they prove tragically and hilariously unable to coexist within 4 walls, either. The play begins with Aston taking in Davies, a loquacious old drifter, from the street. Davies soon makes himself comfortable to a point of amusing impertinence; an ill-fitting smoking jacket becomes his accouterment of choice. When Aston is out, Mick arrives, manic and manipulative, to either bully Davies back into his place as guest (or worse, intruder) or hoist him into a role he is comically unsuited to fill (interior decorator). The room cannot seem to abide all three men at once, so in shifts of two they kick around the question of who has a “right” to be there. Thus, the play progresses like a cruel, absurd game of hacky sack. Typical of gallows humor, the text allows their conversation to fall anywhere between hopelessly grim and outrageously funny (“I wasn’t dreaming. I never had a dream in my life,” Davies earnestly protests after waking up Aston one night with his tossing and jabbering). At least in the first act, under the direction Christopher Morahan this production amps up the comedy through Davies’ kooky antics, faces and stumblings. It is much appreciated, by the time the play’s heavy-as-lead ending rolls around. In classic Pinter fashion, the characters’ pasts never quite materialize. With the exception of a devastating, climactic monologue by Aston – rivetingly delivered by Cox, the stage lights dimming around him so slowly you do not register the change until he is in pitch black – we receive little and often contradictory insight into what might have driven these odd, possibly mad men into a willing confinement they cannot even manage. Clearly, by the play’s conclusion (if you want to call it that), the atmosphere in the room is not so peachy. With a cast of this chemistry, the episodes of compassion, betrayal, pity and despise that cause the air to curdle are completely enthralling. There is only one room and, like it or not, you are in it with them.